When we made it back into the Hall yesterday, the Secretary General said the Pope wanted to say a word. My ears pricked up. This Pope doesn’t take the microphone just for the sake of it. What’s going on here, I thought. Well, again he caught us on the hop. For some time there have been rumblings that we may have a couple of new Congregations in the Roman Curia, and the Pope took this opportunity to announce one of them – a Congregation for the Laity, Family and Life. Not sure why he chose this moment to make the announcement. It may have been a way of saying that things are moving in Rome in order to counteract a sense that has emerged at times in the Synod that nothing either is moving or should move. A gesture against immobilism? Who knows? But the timing was interesting. Nothing has been said about personnel but, as always, structures are only as good as the people you put into them. So we’ll see who the key people turn out to be. After that little bit of news, we settled into the second round of voting for the Post-Synod Council which turned out to be a hoot. I mentioned in an earlier post that the first round of voting had been inconclusive, with votes scattering in all directions. This time we were given the names of the 10 bishops who had got the most votes in the first round in each of the four continental sections (Africa, America, Europe and Asia-Oceania). Of these we had to choose three. Off we went, pressing our little voting machines at the seats. The trouble started when the technology failed in one of the three sections of the Hall. We were voting for Europe. We all agreed that Europe had always been a problem. Technicians were called and ran from all directions. I didn’t realise we had so many technicians looking after a system that is so erratic. It might be better to have a new system and fewer technicians … but the union mightn’t like that. While they tried to fix Europe, the Secretary General decided we should move to the draft of the final document. It was handed out, and I have to say that its production in the time and circumstances was a minor miracle that should be kept in mind in case the cause for canonisation of any of the drafters comes up in the future. The General Relator, Cardinal Peter Erdo of Budapest, gave a brief introduction to the text and sat down. I think (as one of the key drafters) he was exhausted. 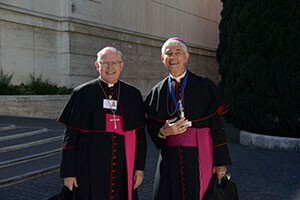 Aussie bishops, Archbishop Coleridge and Bishop Hurley, at the Vatican. Photo by Fiona Basile. The Secretary General then told us that it was our solemn duty to read the text carefully so that we could present proposed amendments the following morning. This was OK for those who know Italian. But the fact is that many of the bishops (and even some of the cardinals!) don’t know Italian or don’t know it well enough to read and respond to a complex document like this one. Bishop Hurley is one of those, so I had to sit down with him last night and go swiftly through the text so that he knew what he was responding to. This was a serious flaw in the Synod process that has been remarked upon by many. It would have taken a bit of money to hire professional translators to turn it into other languages quickly; but surely that would have been money well spent. The same was true of Cardinal Erdo’s important opening speech of the Synod. It was in Italian, and I was told that an English translation appeared the following day only because one of the American bishops paid professional translators to do it. That shouldn’t be the way it works. A thought for next time. The fun and games started again when Cardinal Baldisseri told us that the draft document was so sensitive and super-secret that we couldn’t even take it home. At this, there were serious rumblings in the Hall. Boos were looming. Sensing mutiny, the Secretary General changed his mind: we could take it home but it was strictly for our eyes only. Not a whisper to anyone else. They weren’t even to know we had the document. The background to the Cardinal’s hypersensitivity, I suppose, were the leaks that accompanied last year’s Synod and have troubled the early days of this Synod. We were told that there would be an opportunity to speak in the Hall on Friday morning, outlining in three minutes our proposed amendments to the draft document. We could also submit our amendments in written form to the Secretariat. I decided to put mine in writing and save on the verbiage in the Hall. As it turned out, only a handful of the interventions in the Hall this morning were better given viva voce than on paper. Most should have been submitted in written form to save time and verbiage in the Hall – especially as many simply repeated what had been said before. But a few of them were decidedly worth speaking in the plenary assembly. At one stage in the procession of proposed amendments, we had more synodal farce, which was actually quite refreshing. Can’t beat a laugh at a Synod. The president for the day, Cardinal Tagle of Manila, kept announcing names of bishops to speak who kept replying that they hadn’t asked to speak. This became hilarious – but the best bit was when one of the cardinals who hadn’t asked to speak was called and decided to speak anyway. That brought the house down. Another cardinal protested that he was regularly being called by the name of another cardinal and loudly protested that he was who he was. More good-natured guffaws ensued. 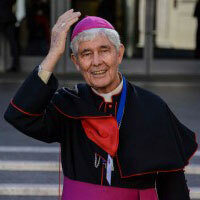 Another bishop had the singular distinction of being cut short for the second time in the Synod. He actually talks a lot of sense but seems to have an uncertain sense of timing. His three-minute speech the other day was cut off when he went too long, and this morning he was again cut a little short as he proposed his amendment to the draft. But he must have felt in good company when one of the cardinals was cut off just before lunch. I’ve learnt at this Synod that the last slot before lunch is a bad time to speak. No matter how profound and important one’s words may be, the bishops are shuffling their papers and packing their bags. They want lunch. We’re free this afternoon while the 10-man Commission is hard at work processing all the proposed amendments, spoken and written. I don’t think their task will be monumental; most of the substantial suggestions concerned only a few paragraphs. By tomorrow morning their work will be done, and the final text will be read in the Hall – paragraph by paragraph – with the bishops voting on each of the paragraphs, hoping like hell that the technology works this time. Pope Francis will be sitting poker-faced up the front, taking it all in and wondering what to do with all this. I don’t doubt for a moment that he already has some thoughts. He’s nothing if not a strategist. Will he make a concluding speech tomorrow evening? I hope he does, but he may think that last Saturday’s landmark speech was enough. We’ll see.